We describe our new research project that aims to use digital technology, data and collective intelligence design to reduce the number of people presenting with late-stage bowel cancer and increase survival rates. In our last blog post, we reviewed the emergence of collective intelligence in health including some promising projects that are helping to create new information solutions for people living with cancer and their clinical teams. Here we want to share a live research project that Nesta’s Health Lab and the Centre for Collective Intelligence Design are running in partnership with the National Cancer Registration and Analysis Service (NCRAS), to explore how we might use digital technology, data and collective intelligence design to reduce the number of people presenting with late-stage bowel cancer and increase survival rates. Until a decade ago, we had limited understanding of the role of late diagnosis in England’s poor cancer outcomes. We didn’t understand why people present late with cancer symptoms, or why some people aren’t getting timely referrals for specialist diagnosis. Due, in large part, to the pioneering work of National Cancer Intelligence Network, which later became NCRAS (part of Public Health England), we can now make these links. NCRAS systematically collect data on every person with a diagnosis of cancer in England, encompassing information about them, their cancer, their treatment and what ultimately happens to them. NCRAS can also link this data with other datasets from the NHS to find out how a patient was diagnosed (whether they were referred from their GP or diagnosed in A&E), and to find out about the quality of their life after treatment. One of the world’s most comprehensive repositories of cancer data, NCRAS has the potential to provide unprecedented insight into the entire patient journey. Although much of the data is sensitive and personally-identifiable, NCRAS have made important strides over the past decade to open up some of their datasets to researchers, commissioners, professionals and the wider public*. Their awarding winning Routes to Diagnosis dataset is one example. 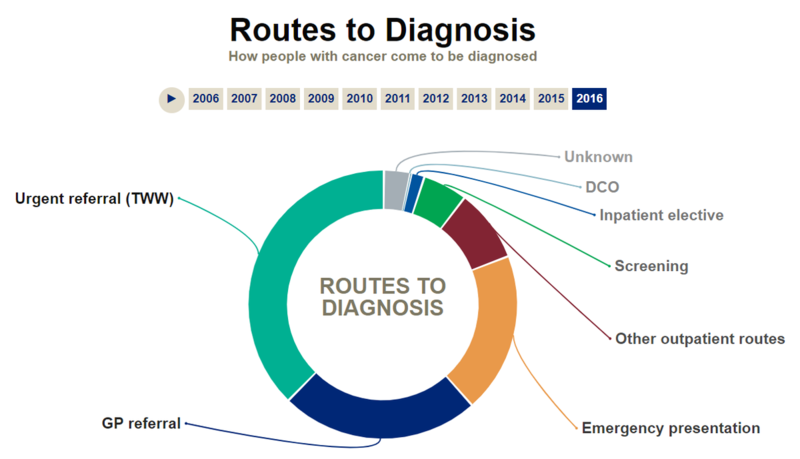 With data from 3 million cancer patients over 10 years, it classifies eight different diagnosis routes, and includes data on each person’s age, ethnicity, location, socio-economic status and type of cancer. *In the case of personally identifiable data, release occurs under strict regulation for healthcare purposes only. Diagram: screenshot of interactive tool on National Disease Registration Service website. 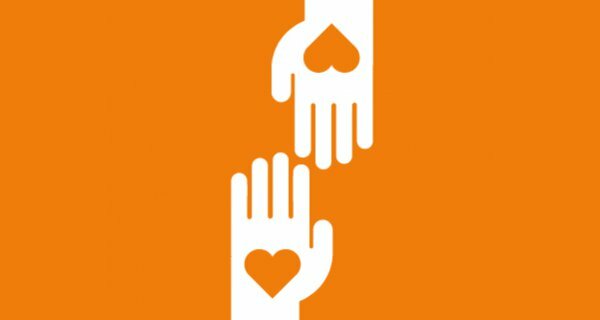 First published with data from 2006, and now collected and updated annually, the release of this data enabled the first associations to be made between how people got diagnosed and their survival rates. This was pivotal in proving the link between late diagnosis and survival rates. The data also revealed substantial regional and demographic variations in cancer survival across England, for example, showing that black men and women are more likely to die from bowel cancer than white men and women. Late diagnosis is more pronounced in some cancers than others. Bowel, or colorectal cancer, is the fourth most common cancer in the UK (behind breast, prostate and lung) and has a 60% survival rate in the UK compared to 72% in Australia. Bowel cancer is steadily increasing in the UK with around 41,800 new cases every year. Over half of bowel cancer cases are diagnosed at a late stage in England, Scotland and Northern Ireland with this being defined as an emergency presentation (A&E or two week urgent referral route). Nearly 98% of people would survive bowel cancer for five years or more if detected at Stage 1 compared with less than one in ten people diagnosed at Stage 4. It’s estimated that around 1,700 deaths from bowel cancer could be avoided each year if survival rates were as good as the best in Europe. So why is there a problem with late diagnosis in bowel cancer? Firstly, many symptoms of bowel cancer are similar to more common conditions such as Irritable Bowel Syndrome (IBS), ulcerative colitis or Crohn's disease. This is particularly problematic for younger people whose symptoms may not be taken seriously by their GP as “they are too young to have bowel cancer”, something highlighted by Bowel Cancer UK’s Never Too Young campaign. Secondly, despite the evidence that bowel cancer screening works (people who take part in the screening programme have a 25% lower chance of dying from the disease later in life) and it being offered to everyone over the age of 60 in England, Wales and Northern Ireland (50 in Scotland), take up rates are low. Only 59% of people invited to take the home screening test in England and Northern Ireland return the sample (56% in Scotland and 53% in Wales) and those in deprived areas or from certain cultural groups are less likely again to take part. Qualitative research shows different reasons for this, with some people unwilling to use the Faecal Occult Blood Test (gFOBT) for personal or cultural reasons and others because they find it too complicated to use . Surveys have found that many people don’t go to the GP because they know it will be difficult to make an appointment and they don’t want to bother them or discuss their symptoms with receptionist staff. GPs in the UK are also less likely to investigate or refer immediately than doctors in countries with higher cancer survival rates. With concerns about capacity in over-stretched colonoscopy clinics and unnecessary referrals, GPs tend to adhere strictly to the NICE guidelines, meaning that some ‘edge’ cases - including young people - can be missed.. Source: Unfinished Business, Health Foundation. The NHS Long Term Plan includes earlier cancer diagnosis as one of its key priorities. This includes a commitment to roll out the new simpler Faecal Immunochemical Test (FIT) and develop new diagnostic pathways and additional endoscopy capacity. The NHS Innovation Accelerator Programme has also prioritised prevention and early diagnosis for cancer, alongside other conditions, and is looking to support new digital, medtech and workforce solutions and models of care. So why are we also looking at this area? Our work in health, and other fields, has shown that new solutions can often be found through a combination of smarter use of data and collective intelligence from patients, their families, clinicians and others working in health and care. We therefore want to explore, together with NCRAS, whether there is potential to use digital technology and collective intelligence design to gather new insights from the data - including from and for citizens - in ways that can help reduce the number of people presenting with late-stage bowel cancer and improve survival. This report examines patient organisations’ ever more critical role as knowledge brokers in an increasingly complex, data-rich healthcare system.